Over ninety percent of our students take the six-month Master Trainer Course; however, if you are not able to attend school for six consecutive months, you can begin with the three-month Obedience Behavior Course and complete the remainder of the Master Trainer Course at a later date. We recommend you take the six-month course if you intend to make dog training a full-time career. Upon completion of a The K9 Training Academy course, graduates are authorized by The K9 Training Academy to use the title Certified Professional Trainer or letters CPT after their name. The K9 Training Academy graduates pursue a multitude of options within the field of dog training. While most establish their own full-time or part-time training practices, others work with established training centers, veterinarian practices, boarding facilities or other dog related businesses. Some graduates also decide to pursue more specialized interests within the field; such as police k-9, voluntary search and rescue/recovery, scent detection, assistance dog training, therapy dogs, dog sporting activities, and much more. Interested individuals throughout the United States and over 4 foreign countries have completed a course at The K9 Training Academy. These individuals have come from all walks of life; including: recent high school graduates, administration, industry, education, the arts, government, and more. Regardless of their background these individuals share a common goal: to make a living in a fulfilling career they enjoy. We invite you to explore what The K9 Training Academy and its courses can offer. 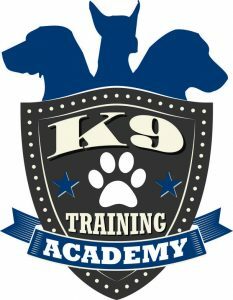 The K9 Training Academy for Dog Trainers provides students with more than a basic education; students are offered the knowledge and skills required for professional dog training. 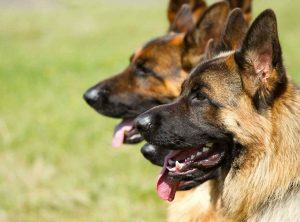 The broad scope of The K9 Training Academy’s curriculum immediately prepares students to begin a full-time or part-time career training dogs upon completion of our courses. Professional dog training is a profitable and satisfying occupation whether as a main career or as a second income. Our three-week Obedience Behavior Course specializes in teaching students obedience training, behavioral counseling, puppy development, and customer relations with dog owners. Whereas, the six-week Master Trainer Course continues by covering the advanced aspects of today’s professional dog trainer; including retrieval, owner protection, assistance dog training, tracking/trailing, scent detection, and basic police K-9. The Master Trainer Course also provides students with information on dog care, kennel management, and insight into establishing a successful small business practice.